I blame Hello Yarn and the Japanese Bookstore. I have been on a major potholder kick recently, which a year ago I would have thought was about as possible as a toilet paper cozy kick, but one can never predict where your interests will take you. Anyway, it started when my mom sent me a vintage potholder she had found at an antique store. 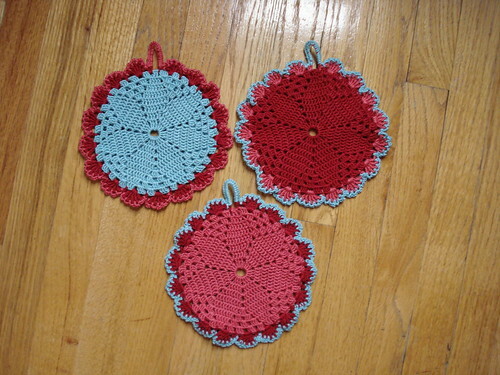 She had been inspired by Hello Yarn's recent vintage potholder acquisitions and subsequent pot holder crocheting experiments. The weekend after receiving the potholder I turned it into a pattern and made three with some Karabella Vintage Cotton that was just not working with the scarf pattern I had started ages ago. This also happened to mark the start of my blue/red trend. 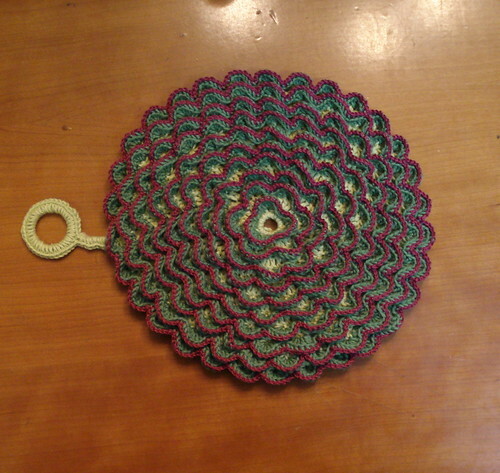 The next pattern I started using was the Pretty Petals Potholder. 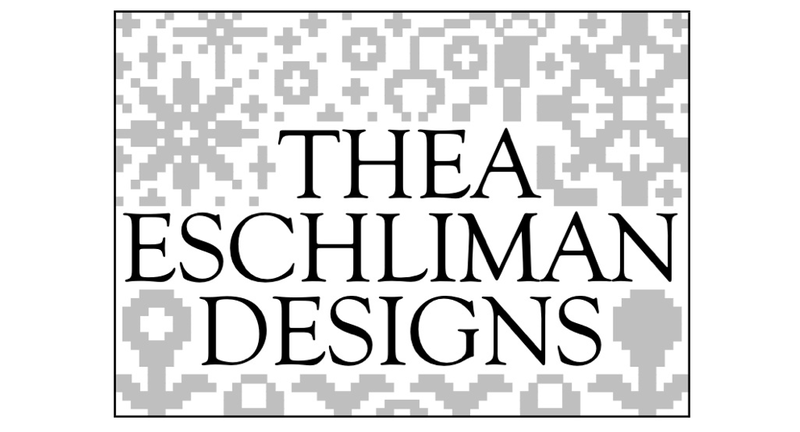 I only loosely followed the pattern since I hate reading crochet patterns. They should all be in graph form like the Japanese patterns. I used some Sensa Cotton that I had hanging out in my stash and some Paton's Grace. I ended up bringing this one to my grandmother and it was used as a trivet under the many bouquets of flowers she was receiving. The color in the pictures is a bit deceiving. It is actually bright pink with pale green leaves. I had so much fun making that one that I picked up some Rowan 4 ply cotton, which is very sadly discontinued, and came up with a cabbage pattern. 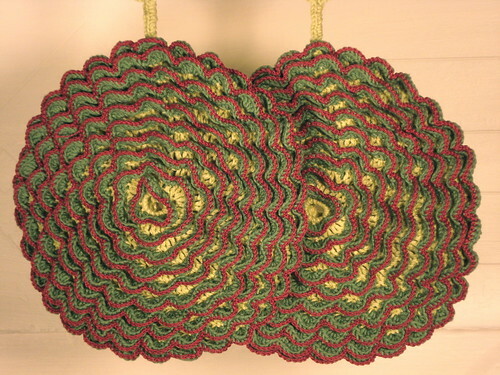 This is accomplished by using a light green as the base, dark green as the petals and a dark purpley-maroon as the accent. 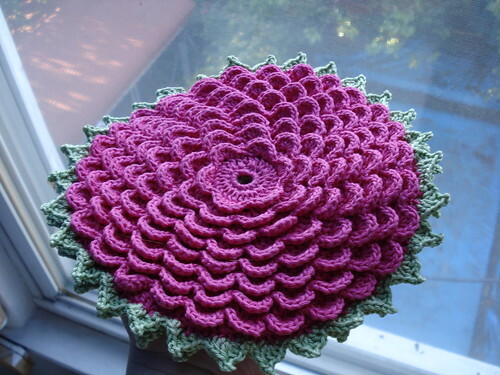 The purpley-maroon is crocheted onto the back loop of the top of the petals. I also added a row to the center of the potholder. The picture does not do it justice because the finished product is awesome. I just have trouble taking pictures in one of the rooms in my apartment. I swear it is the black hole of light. I am making like a dozen more pairs of these. I love them, and they have already been gifted. 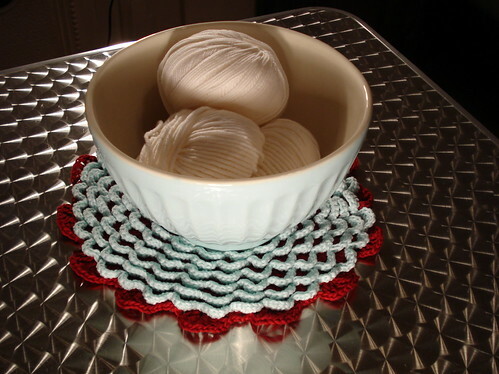 Finally, I made a placemat out of the pretty petals pattern. I picked up some Blue Sky Skinny Dyed Cotton, which Holy Crap is amazing stuff, and whipped this up. Seriously, if I won the lottery, which coincidentally I don't actually play, I would buy enough of this yarn for several sweaters and a blanket. The Blue Sky people have a way with colors and that Glacier is the perfect delicate light blue.